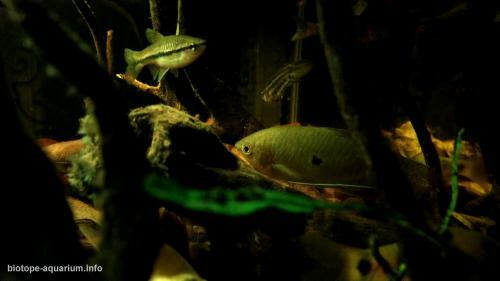 Description of decorations: The decorations is simulated from the natural habitat of the Barbodes Dunckeri in Mersing, Johor. 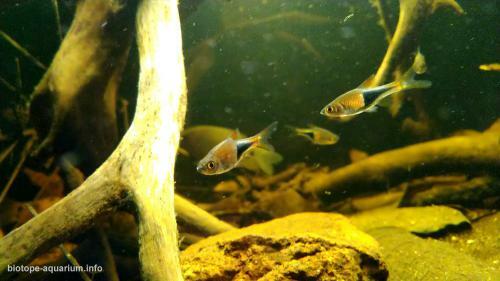 The Barbodes Dunckeri and other phylum chordata are genuinely caught from the original habitat in clear stream forested foothills. The addition of dried leaf litter (catappa s.p and Macaranga s.p) to further emphasis the natural feel and with it the growth of beneficial microbe colonies as decomposition occurs. These can provide a valuable secondary food source, whilst the tannins and other chemicals released by the decaying leaves will aid in the simulation of a water environment. The light purposely dimmed to maintain the habitat authenticity due to the dense canopy of branches above means very little light penetrates the surface. 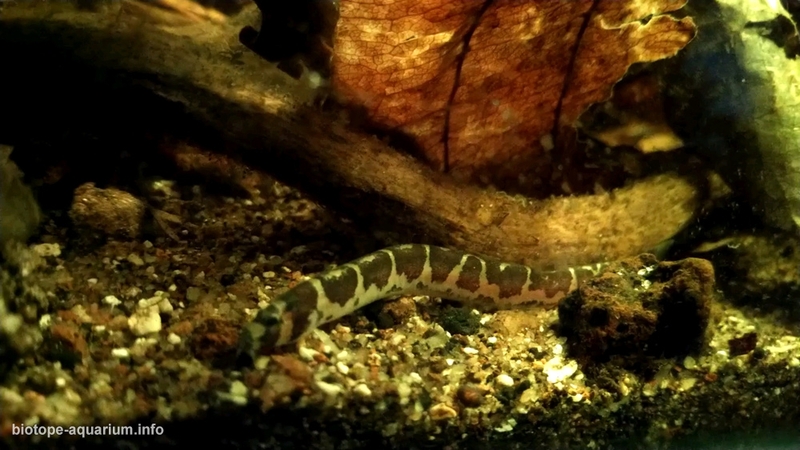 The Substrate: Soft sandy substrate with wood roots and branches placed such a way that plenty of shady spots and caves are formed for hiding places as the Barbodes Dunckeri will swim in all parts of the tank but prefers open areas in the middle of the tank. Description of equipment: submerse pump, overflow box, sum tank and LED lamp. Water parameters: Temperature is 28°C, pH is 5.4. Description of the area surrounding the biotope: In Malaysia, 55% of land area is forested and endows a rich diversity of flora and fauna. Peat swamp forests constitute a significant component of forest and account for about 75% of the country’s total wetlands. The state of Johor in Malaysia is noted for its national parks and forest reserves which preserve virgin rainforests known for its biodiversity and endangered species of animals. Sungai Mersing is a river in the state of Johor, Malaysia (Asia) with the region font code of Asia Pacific. It is located at an elevation of 8 meters above sea level and its population amounts to 55,658. It flows from south to north with a catchment of 270 km². The river estuary meets the South China Sea. Its coordinates are 2°22’60” N and 103°52’59” E in DMS (Degrees Minutes Seconds) or 2.38333 and 103.883 (in decimal degrees). Description of the underwater landscape of the biotope: In nature, the Barbodes Dunckeri show a preference for shallow areas of the water, around 6 inches deep. It inhabits streams and waters that are characterized principally by low mineral content, high concentrations of dissolved humic acids, which is typical of water found flowing through peat swamp forests. Due to the presence of decomposing organic debris, the water is sometimes stained a yellowish brown by tannins and other chemicals. Description of the parameters of the habitat: The water is soft and weakly acidic or neutral with PH normally ranging from 5.0 – 7.0, and the forest canopies often keep it shaded. This Barbodes Dunckeri also prefers warmer water than many freshwater fish, needing temperatures between 26-28° C.
List of fishes and invertebrates occurring in the nature biotope: Licorice Gourami (Parosphromenus harveyi), Croaking Gourami (Trichopsis vittata), Chocolate Gourami (Sphaerichthys osphromenoides), Pearl Gourami (Trichopodus leerii), Dwarf Rasbora (Boraras maculatus), Brilliant Rasbora (Rasbora einthovenii), Glowlight Rasbora (Trigonopoma pauciperforatum), Harlequin Rasbora (Trigonostigma heteromorpha), Giant Pikehead (Luciocephalus pulcher), Betta Livida, Bangka Snakehead (Channa bankanensis), Clown Barb (Barbodes dunckeri), ‘Pentazona’ Barb (Desmopuntius hexazona), Three-spot Gourami (Trichopodus trichopterus), Striped Glass Catfish (Kryptopterus macrocephalus), ‘Kuhli’ Loach (Pangio semicincta). 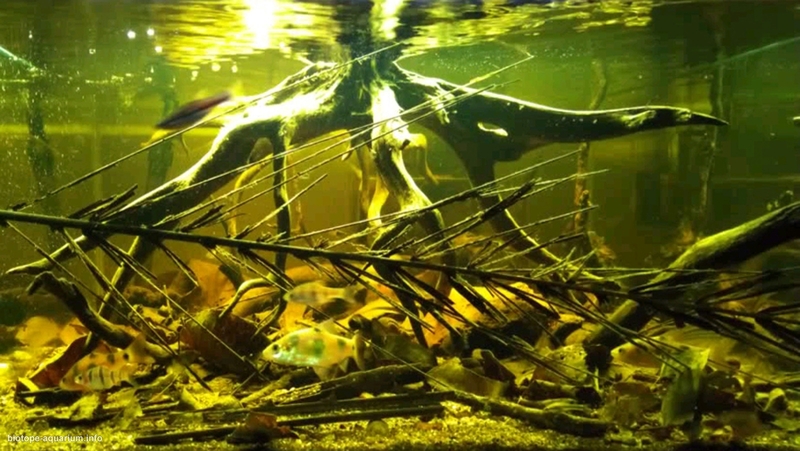 List of plants found in the nature biotope: The aquatic plant observed are: Eleocharis sp., Nymphoides aquatica, Barclaya motleyi, Blyxa aubertii, Cryptocoryne nurii, Cryptocoryne cordata, Cryptocoryne affinis. Threats to the ecology: Peat swamp forests within the tropical moist broadleaf forests, store and accumulate vast amounts of carbon as soil organic matter much more than natural forests contain. Their stability has important implications for climate change. Peat swamp forests are one of the most threatened, yet least studied and most poorly understood. The importance of peat swamp forests in relation to maintaining the environmental stability includes flood mitigation, revitalizing the soil and providing a limited source of water during droughts, and as a carbon store and carbon sequestration. Across in Southeast Asia these biotopes are under threat from rubber/palm oil plantations, building developments and other human activities. Vast primary forest has been almost completely changed or lost. 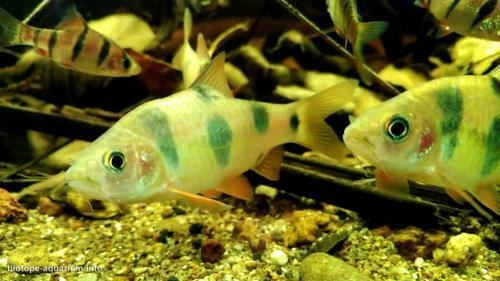 Fish habitats in affected areas have also been widely modified in many cases with species diversity decreasing as a result. Peat also accumulates gradually over thousands of years, so cannot be replaced once removed, therefore, no way it can be considered a renewable or sustainable resource. 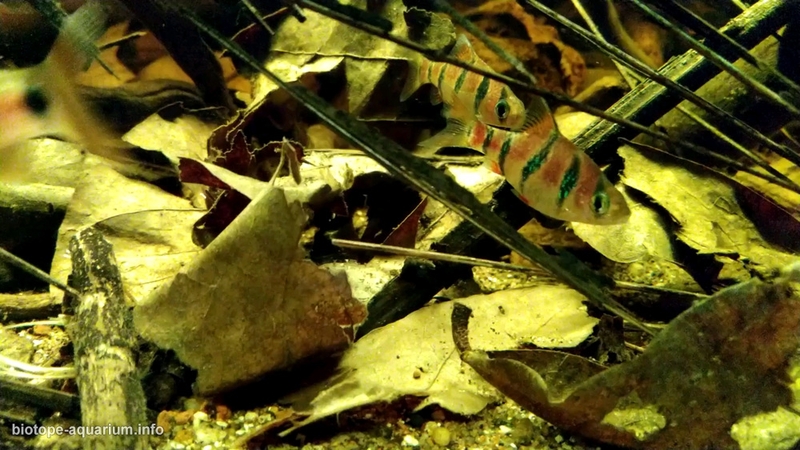 This peat-rich environment supports diverse and unique biological communities that can’t be regained once lost. The challenge here is to be able to document the fauna and its basic ecological information before it becomes extinct and to increase the effectiveness in conservation efforts.